The RoboBees project "provides a common motivation for scientists and engineers across the university to build smaller batteries, to design more efficient control systems, and to create stronger, more lightweight materials," says Harvard engineering professor Robert J. Wood. "You might not expect all of these people to work together: vision experts, biologists, materials scientists, electrical engineers. What do they have in common? Well, they all enjoy solving really hard problems." Credit: Kevin Ma and Pakpong Chirarattananon, Harvard University. In the very early hours of the morning, in a Harvard robotics laboratory last summer, an insect took flight. Half the size of a paperclip, weighing less than a tenth of a gram, it leapt a few inches, hovered for a moment on fragile, flapping wings, and then sped along a preset route through the air. Like a proud parent watching a child take its first steps, graduate student Pakpong Chirarattananon immediately captured a video of the fledgling and emailed it to his adviser and colleagues at 3 a.m.—subject line, "Flight of the RoboBee." "I was so excited, I couldn't sleep," recalls Chirarattananon, co-lead author of a paper published this week in Science. 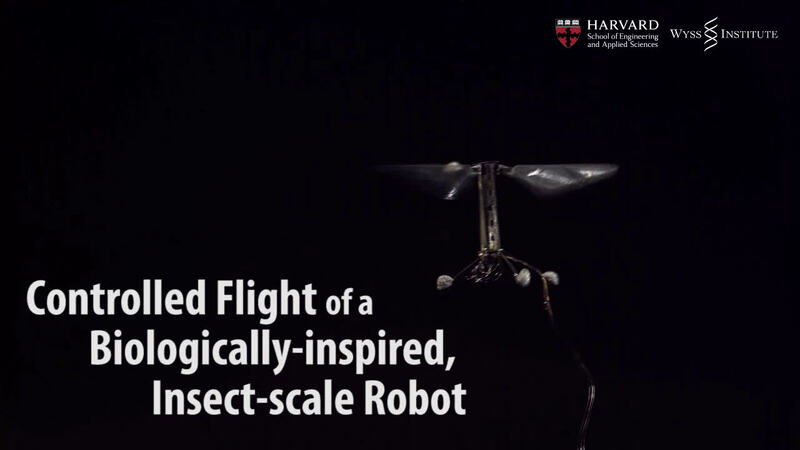 The demonstration of the first controlled flight of an insect-sized robot is the culmination of more than a decade's work, led by researchers at the Harvard School of Engineering and Applied Sciences (SEAS) and the Wyss Institute for Biologically Inspired Engineering at Harvard. "This is what I have been trying to do for literally the last 12 years," says Robert J. Wood, Charles River Professor of Engineering and Applied Sciences at SEAS, Wyss Core Faculty Member, and principal investigator of the National Science Foundation-supported RoboBee project. "It's really only because of this lab's recent breakthroughs in manufacturing, materials, and design that we have even been able to try this. And it just worked, spectacularly well." "We had to develop solutions from scratch, for everything," explains Wood. "We would get one component working, but when we moved onto the next, five new problems would arise. It was a moving target." Flight muscles, for instance, don't come prepackaged for robots the size of a fingertip. "Large robots can run on electromagnetic motors, but at this small scale you have to come up with an alternative, and there wasn't one," says co-lead author Kevin Y. Ma, a graduate student at SEAS. The robotic insects also take advantage of an ingenious pop-up manufacturing technique that was developed by Wood's team in 2011. Sheets of various laser-cut materials are layered and sandwiched together into a thin, flat plate that folds up like a child's pop-up book into the complete electromechanical structure. The quick, step-by-step process replaces what used to be a painstaking manual art and allows Wood's team to use more robust materials in new combinations, while improving the overall precision of each device. "We can now very rapidly build reliable prototypes, which allows us to be more aggressive in how we test them," says Ma, adding that the team has gone through 20 prototypes in just the past six months. Applications of the RoboBee project could include distributed environmental monitoring, search-and-rescue operations, or assistance with crop pollination, but the materials, fabrication techniques, and components that emerge along the way might prove to be even more significant. For example, the pop-up manufacturing process could enable a new class of complex medical devices. Harvard's Office of Technology Development, in collaboration with Harvard SEAS and the Wyss Institute, is already in the process of commercializing some of the underlying technologies. Inspired by the biology of a fly, with submillimeter-scale anatomy and two wafer-thin wings that flap almost invisibly, 120 times per second, this tiny robot not only represents the absolute cutting edge of micromanufacturing and control systems; it is an aspiration that has impelled innovation in these fields by dozens of researchers across Harvard for years. Credit: Kevin Ma and Pakpong Chirarattananon, Harvard University. "Harnessing biology to solve real-world problems is what the Wyss Institute is all about," says Wyss Founding Director Don Ingber. "This work is a beautiful example of how bringing together scientists and engineers from multiple disciplines to carry out research inspired by nature and focused on translation can lead to major technical breakthroughs." "Now that we've got this unique platform, there are dozens of tests that we're starting to do, including more aggressive control maneuvers and landing," says Wood. The prototypes are still tethered by a very thin power cable because there are no off-the-shelf solutions for energy storage that are small enough to be mounted on the robot's body. High energy-density fuel cells must be developed before the RoboBees will be able to fly with much independence. Control, too, is still wired in from a separate computer, though a team led by SEAS faculty Gu-Yeon Wei and David Brooks is working on a computationally efficient brain that can be mounted on the robot's frame. 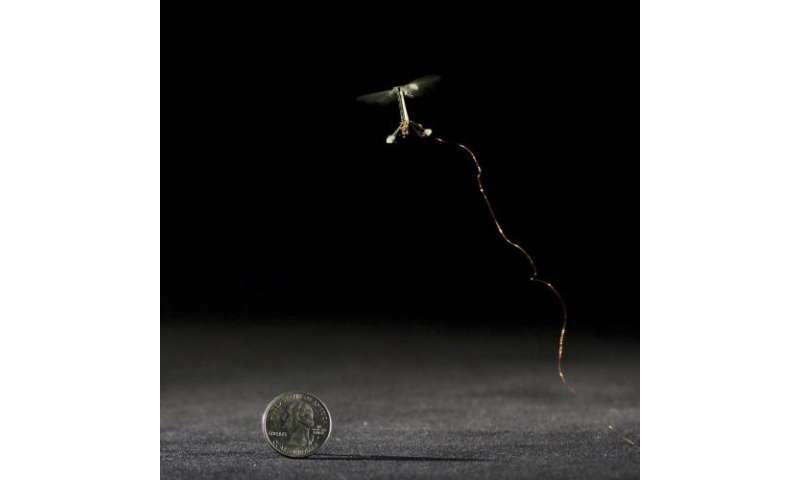 "Flies perform some of the most amazing aerobatics in nature using only tiny brains," notes coauthor Sawyer B. Fuller, a postdoctoral researcher on Wood's team who essentially studies how fruit flies cope with windy days. "Their capabilities exceed what we can do with our robot, so we would like to understand their biology better and apply it to our own work." The milestone of this first controlled flight represents a validation of the power of ambitious dreams—especially for Wood, who was in graduate school when he set this goal. "This project provides a common motivation for scientists and engineers across the university to build smaller batteries, to design more efficient control systems, and to create stronger, more lightweight materials," says Wood. "You might not expect all of these people to work together: vision experts, biologists, materials scientists, electrical engineers. What do they have in common? Well, they all enjoy solving really hard problems." "I want to create something the world has never seen before," adds Ma. "It's about the excitement of pushing the limits of what we think we can do, the limits of human ingenuity." 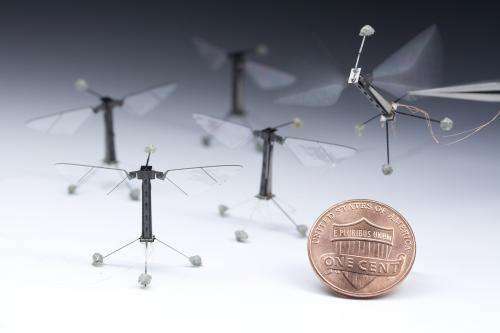 More information: "Controlled Flight of a Biologically Inspired, Insect-Scale Robot," by	K.Y. Ma et al. Science, 2013. When Bats can Echolocate and hunt for their prey (Insects) Why not these Robots? Well, I might be wrong, but I think the fly pulls it off by having an on-board fuel (glucose) and combining it with oxygen from the surrounding air. Good luck mimicking that though. Energy constraints will prohibit any practical use. Are you sure about that? I wouldn't presume to know what the future holds! I think this may be the first time I almost agree with you--to a point. These are really cool dumb actuators. Perhaps akin to A.G. Bell inventing the microphone. Doesn't change your life much without the rest of the telephone. With the energy source, control system and electric drivers for the piezo motors all off-board, new chapters in inventing an autonomous artificial insect begin. Still a proud achievement, none-the-less. In fact, controlling and outfitting an organic insect might be a better avenue to achieving one's beneficial or nefarious ends. Fit them with a rectenna and beam the power to 'em. Power is there in abundance. Same goes for control/sensors: Who says the sensory/control systems must be housed on the same entity? Could be house on independent systeem. Picture a solar powered hub in the middle of a field beaming out the power and directions for a swarm of these artificial bees. Voila: artificial pollination.